One of the new standing terraces at Harrogate Town's CNG Stadium. Building work at the club's Wetherby Road base has now been completed, however approval for the use of the additional facilities is yet to be granted by Harrogate Borough Council. Town had hoped to be able to open one of their standing terraces when Boreham Wood visit on Saturday afternoon. "It remains the case that we still await formal documentation to be issued to allow us to use the new terraces and seated stand," managing director Garry Plant explained. "We had hoped to use the terrace behind the goal this Saturday against Boreham Wood and pressed the matter with the regulatory body, but approval has not been forthcoming. Improvements to their ground have seen a brand-new seated stand and two standing terraces erected, meaning that Town now boast a holding capacity of 4,108, including 600 covered seats. 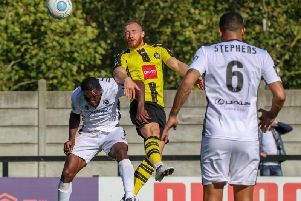 The work that they have undertaken brings the CNG Stadium in line with FA A Ground Grading criteria and the stipulations of the English Football League. With Simon Weaver's team on the verge of securing a National League play-off spot and thus being in contention for promotion to League Two, a ground capacity of 4,000 is one of the requirements that had to be fulfilled for them to be eligible to make the step up.